"39 Steps is a comedic spoof of the classic 1935 film, with only 4 actors portraying more than 150 characters, sometimes changing roles in the blink of an eye. The brilliantly madcap story follows our dashing hero Richard Hannay as he races to solve the mystery of The 39 Steps, all the while trying to clear his name! The show's uproarious fast-paced 100 minutes promises to leave you gasping for breath... in a good way!" Ben Brantley of the New York Times calls it "Absurdly Enjoyable" and "This century's most tireless and high-profile example of 'the little show that could.' The Daily News says it's "A Dizzy Delight!" Liz Smith calls it "The Most Entertaining Show on Broadway. 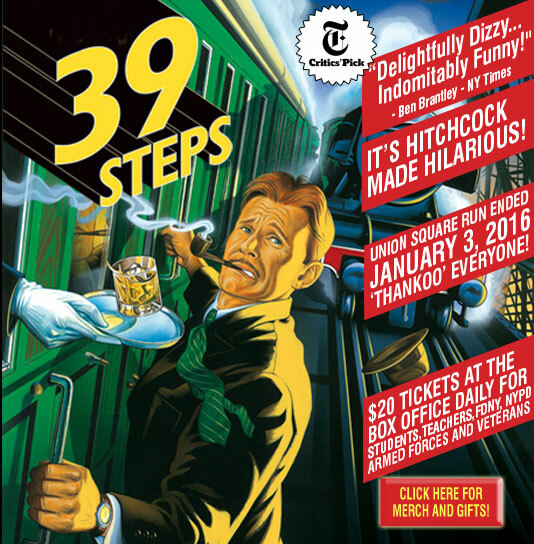 The modest double digits in its title don't begin to capture the exponentially increasing numbers conjured by "39 Steps," in previews at the Union Square Theater. 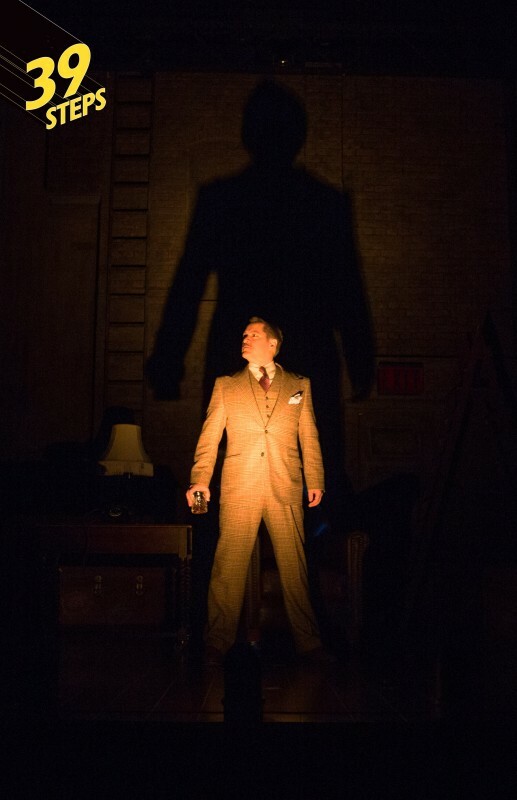 Since its British debut a decade ago, this delightfully dizzy little play — adapted from "The 39 Steps," the 1935 Alfred Hitchcock film about love (and espionage) on the run — has divided and multiplied itself in ways that would shame an amoeba. It features a cast of four playing 150 characters, who pursue, run from and deceive one another on a basically bare stage that somehow feels incredibly crowded. Still running in London's West End, where it opened in 2006, the play has been seen in more than 20 countries, with a whopping Broadway run of 771 performances (that ended in 2010). Now it returns with its original director, Maria Aitken, and a quarter of its original four-member Broadway cast, the frantically industrious Arnie Burton, who one hopes has had a good rest in the interim. "THIS CENTURY'S MOST TIRELESS AND HIGH-PROFILE EXAMPLE OF THE LITTLE SHOW THAT COULD"
Download our new 2015 New York Times review. "A UNIQUE PIECE OF SCREWBALL COMEDY"